The build that follows is based on the fairly recent release of the old AMT Corvette "Sock it to Me" kit, which I bought entirely because of the box-art. 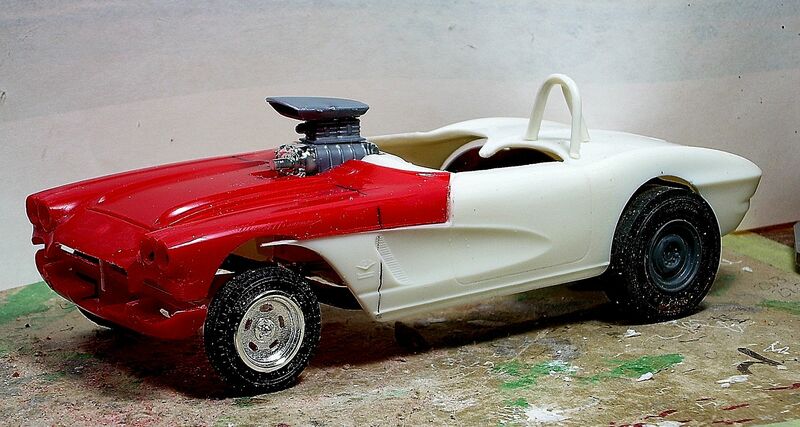 I'd wanted to do an old early-to-mid-'60s modified-sports (MSP) drag car for some time, and this AMT kit looked like a likely starting point for something along these lines (below). Look close and you'll see this thing has a gasser stance, but WAY more engine setback, and also appears to be a one-piece clone body (no door seams). This is in keeping with the MSP rules, which allowed 25% engine setback (defined as the distance from the front axle centerline to the first spark plug hole, as a percentage of wheelbase). 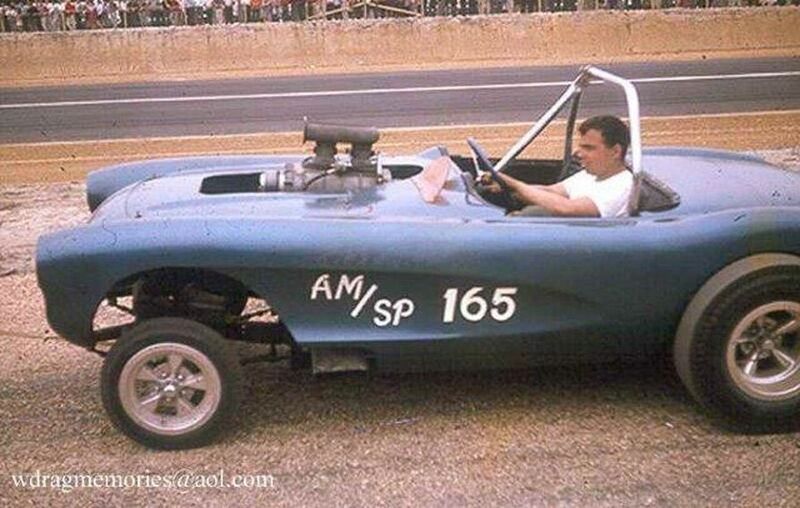 True gassers could only run a 10% engine setback, and were built under more restrictive rules generally. The MSP class was never very big (though it was one of my favorites) and ended up getting lumped in with the "altered" class eventually, which was quite similar in specification...other than the bodies. When I actually OPENED the box, to say I was disappointed is an understatement. Though there are some neat parts in it (and the decals look GREAT), the body is really kinda poor, and the chassis is the typical old AMT blobular style with molded-in everything. 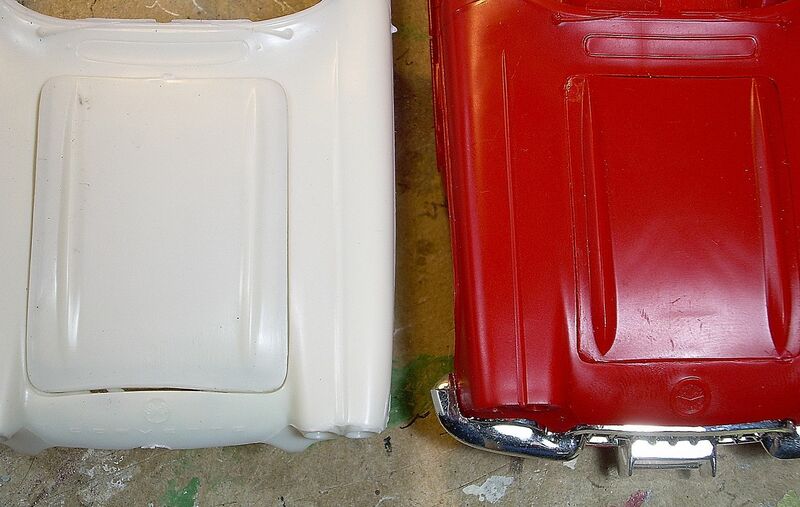 The "gasser" parts are not well done either (I was hoping for something much better), so I decided to hack it into what I wanted while using up some other 50-year-old parts in the bargain. The first problem is the nose. 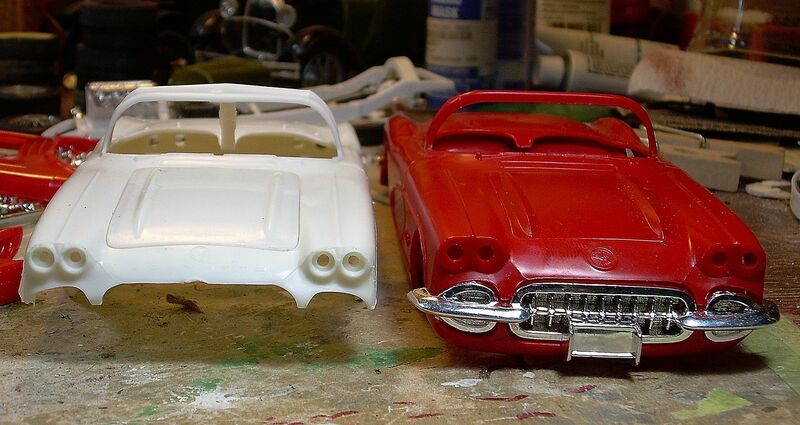 The white body on the left is from the SITM kit, with ridiculously undersized headlights. The shape and profile of the front of the hood is also entirely wrong. 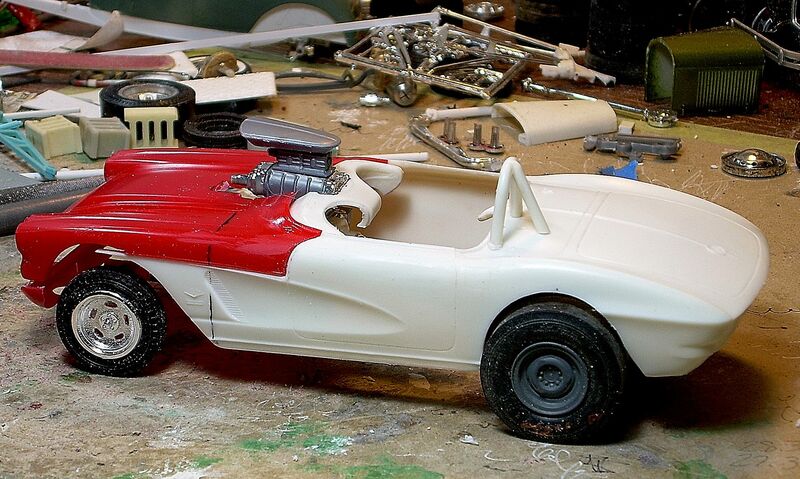 Compare it to the red body, which is the old AMT '59 Corvette (Reggie Jackson version in this case). While the red '59 still isn't right, it's a lot closer than the SITM version. 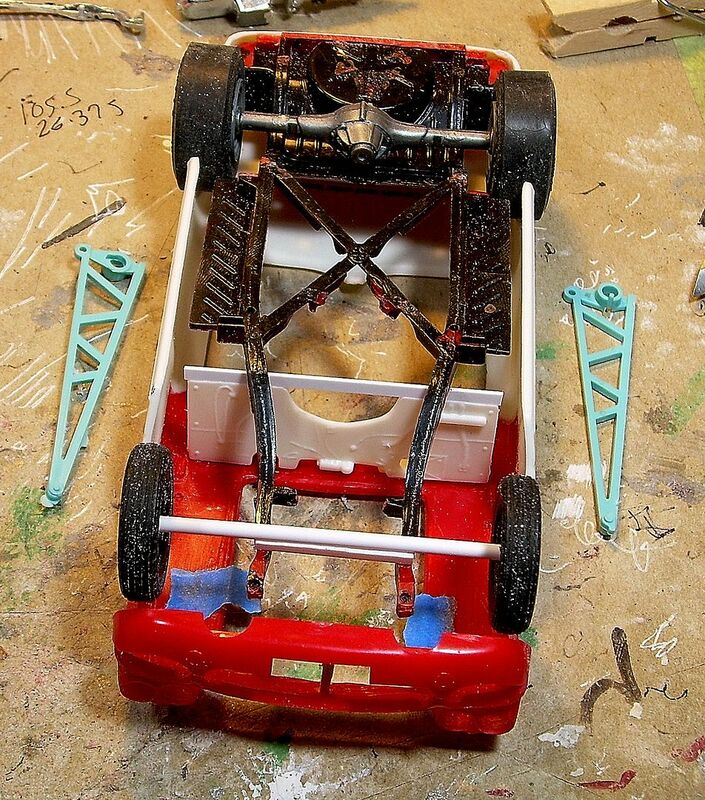 Next big problem is the chassis. On the left is the SITM unit. Wrong frame-rail design, stuff molded in, etc. 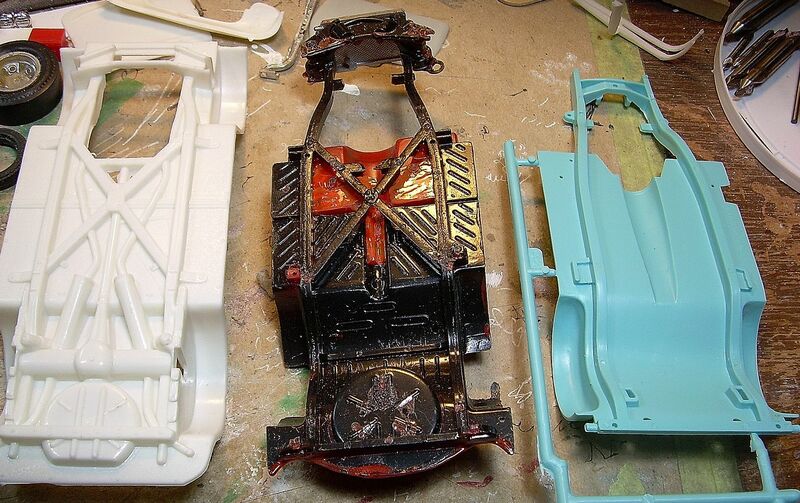 Far right is the blue chassis from the Revell Miss Deal Studebaker funny car kit. 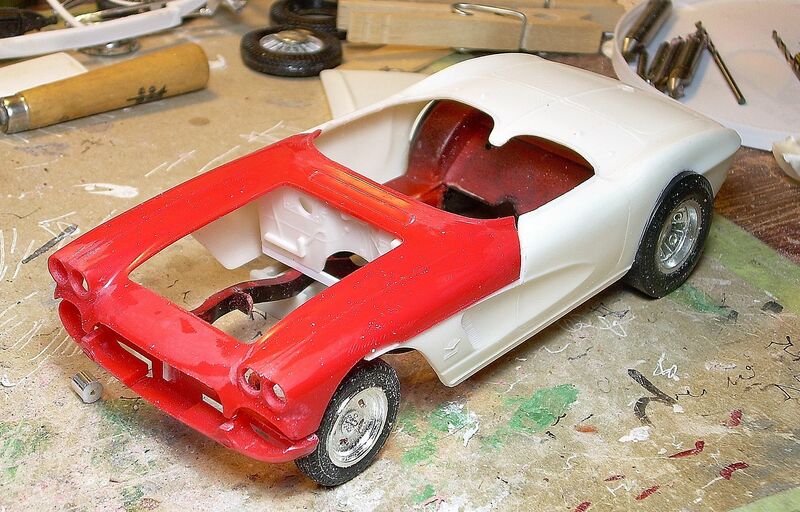 It's obviously C1 Corvette...which I hadn't realized until this point...but Tim Boyd had used this chassis under something similar some time back, so I opted to use a glooey earlier MPC C1 chassis, in the center. I had an extra AMT '59 upper nose floating around from another project's leftovers, so it got loosely grafted to the front of the hacked-off SITM body, all on the old gluebomb chassis. I used the SITM firewall and some strip stock to mock up and jig the chassis in position with the rails parallel to the rockers, at the right height relative to the body. I found a mystery Ford 9" with some slicks, decided to use the lift bars from the Miss Deal kit, and mocked up a straight axle in the front. All mocked-up with the engine in about the right place, etc. all your builds are on point , glad to see it . I really admire the vision and artistry going into this. Don't let that bad kit stop you. Can't wait for more.